In early August I started an 11-day trip, the longest I’ve ever taken, that included three cross-country flights (thankfully all non-stop) and a two-day drive. I started off flying to Baltimore to visit my brother’s family and help sort through my dad’s papers, then flew to Texas to help my mom finish packing for her move to Georgia where she’ll be near my sister, drove with my mom from Austin to Atlanta, then flew back home from Atlanta to Portland. I was going to constantly be on the move and didn’t want to risk lost luggage, and I also didn’t want to take up much room in the car, and I was going to be walking home from the train at the end of the trip, so I took just two bags, my Tom Bihn ID messenger bag that went under the plane seat, and my Tom Bihn Aeronaut 45 travel bag that went in the overhead bin. Inside the two bags were an array of smaller bags that kept me organized, most also from Tom Bihn. The big bags have o-rings inside for attaching key straps so my keys, a small flashlight, and a USB drive were easily found. I used one of my mesh organizer bags in the ID for cables, medicine, and food that I wanted on the flight, while the other in the Aeronaut held cables and other items I wouldn’t need until I landed. Travel stuff sacks held a raincoat (which didn’t get used) and my camera and lens (which did). My daily pills went in a clear organizer and smaller items went into the flat organizer pouches. The organizers worked well in the side pockets of the Aeronaut, making it easy to get to my 3-1-1 bag at the airport, and also provide easy access to food or medicine or cables without having to open the main compartment. The Aeronaut I’ve used before, both while flying and driving, but it really shone on this trip. I used the backpack straps while moving through the airport, then neatly tucked them away for the plane rides and at my destination, but they were most handy when walking home from the train station. Rolling bags have their uses, but since the Aeronaut wasn’t heavy it was much nicer to just slip it onto my back. I’ve been surprised at how using the mesh packing cubes for clothes and the organizer bags for other items makes living out of a suitcase so much more enjoyable, everything stays organized and it was always easy to find what I wanted. Despite staying somewhere new about every other night, by the end of the trip everything was still in its place, which is not normal for me but will be from now on. 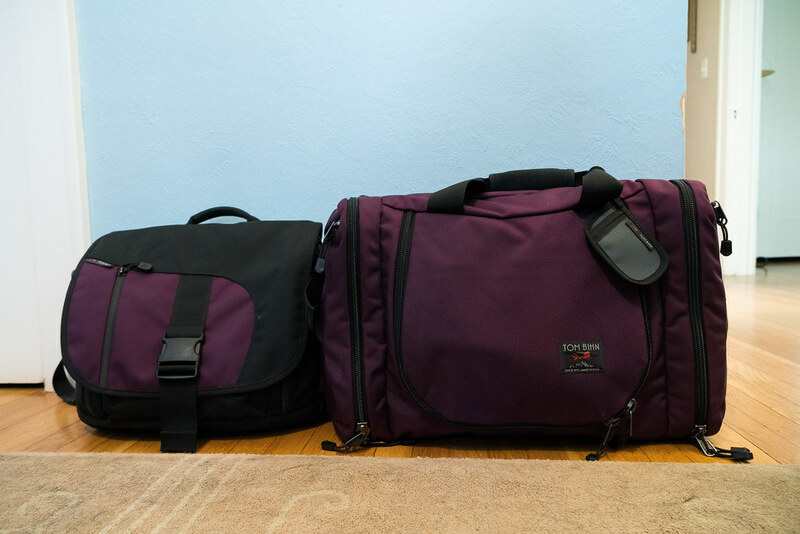 The Aeronaut is well-built and I could have checked it if I needed to, but it was easy to carry and so easily fit in the overhead bins that it was never an issue. The trip didn’t get off to the best start as I had a miserable headache the first morning, one of the worst in recent memory, but by evening medicine was keeping it at bay and it was never that severe again. It was a tiring but productive trip and I enjoyed getting to see most of my family, even a cousin and his son I hadn’t seen in years. Coming home I even got a cheap upgrade to first class, a welcome treat as I despise flying. While I’m never going to enjoy flying I am thankful that all the flights went off without issue, as did our drive, and I’m thankful for the little company that designs and makes the bags that I love so much (all a bit to my north in Seattle). 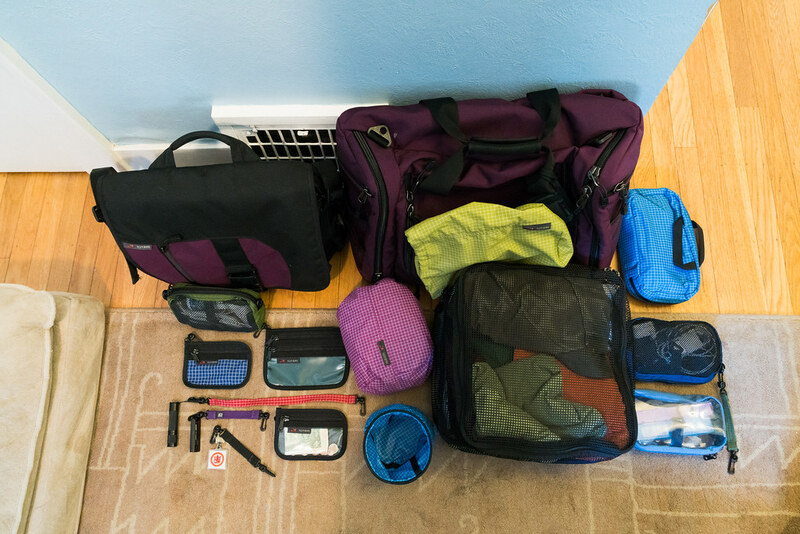 This entry was posted in General and tagged 3D Organizer Cube Clear, Aeronaut 45, Aeronaut Packing Cubes, Clear Organizer Wallet, Double Organizer Pouch, ID, Key Straps, messenger bag, Spiff Kit, Tom Bihn, travel bag, Travel Stuff Sack, Travel Tray. Bookmark the permalink.